Bloodskal Barrow is a burial ground on the northern border of the Hirstaang Forest, north-northwest of Raven Rock. The barrow is built into a large hill that should be easily noticed. If you can't find the hill, find the Earth Stone and look to the northeast, you may also pass by the hill if you are traveling to the Cave of Hidden Music. The door is locked and trapped. When you first enter the tomb, it seems completely deserted. 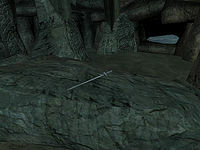 There is little in the cave beyond its namesake, the sword Bloodskal, which is on an altar in the middle of the room. When you pick up the sword, you will receive a journal entry and a couple of greater skeleton champions will ambush you. Additionally, three draugr will be waiting near the exit. The tomb itself contains raw stalhrim, various potions, gold and some uncommon magical weapons and apparel. The tomb also makes an appearance in Dragonborn. This page was last modified on 29 March 2014, at 10:40.